When I first found out I was pregnant I tried to hurry up and "grow up". I threw out music and dvds I thought were not child friendly. I surrounded myself in all things baby. I even had my husband sell our XBOX. I thought getting rid of these things was going to make me be more grown up. Well I have to admit I was a bit nuts when I was pregnant and have learned its a maturity level not the stuff I have that makes me a parent. Video games has always been a source of fun for my hubby and I. I have fond memories of us when we first moved in together eating cheesecake and playing our video games until the early hours of the morning. Good times, good times!! Since we are now parents we do have to stay home more and watching tv can sometimes be the same old same old. We really wanted a video game system for Christmas and then for my husbands birthday in early January but we could not afford one. 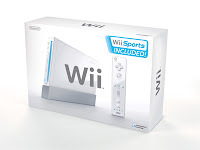 Then out of the blue my brother and sister in law decided to send us their Nintendo Wii !! We were so thrilled!! I have to admit I have been bowling, golfing, and figure skating on my Wii like crazy. I even have a sore arm lol. The best part about it is seeing my husband and son sitting there together smiling while they play. My husband is a only child and he grew up on video games and I think he was a bit sad when I made him sell our last system. Now they get to have a blast on it together. 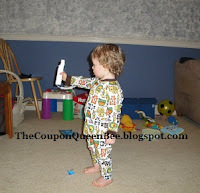 I know my little guy is only 14 months old but oh my you should see him squeal and jump when he plays the Wii. His favorite two games are the bowling and badminton. He swings the controller and can actually play the game, its so stinkin cute!! So with all that said I sooooo recommend the Wii for families. I know right now my son can't play all the games but he loves to hold his controller while his daddy plays. With all this cold weather here in Northern Cali we are wimps about going outside to play so the Wii has definitely helped us to have indoor fun and save on gas money! Do you recommend any fun family games or great kids games?? Better yet do you have a giveaway for a game?? I would definitely enter! 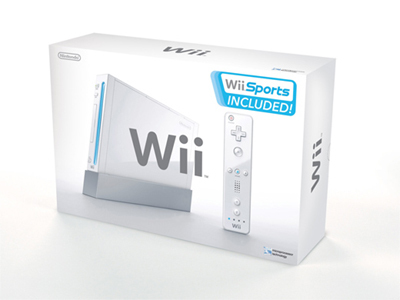 A BIG Thank you to my brother and sister in law for the super awesome Wii!!! We love our Wii too! We use it nonstop and it has so many great games! Thanks for stopping by Harvest For Tomorrow and linking up to Sensational Sunday Follow. I am your newest follower. Going to go check out your Valentine's Day giveaways! We've had our Wii for at least 3 years now and we still love it! I love Wii Fit Plus and they make a Wii Fit for kids as young as 3 now too but I haven't tried it yet!